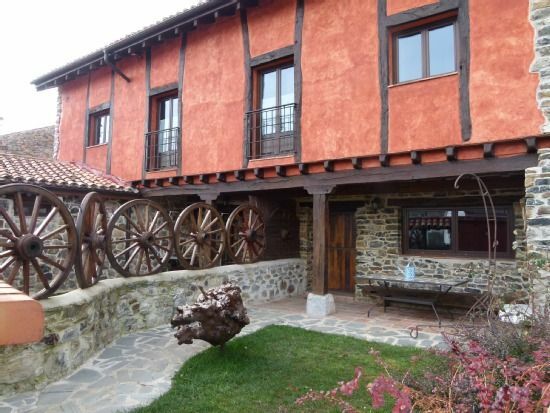 The rural houses "Corva and Parda" are two full-rental rural houses that can be rented separately or both. They are the result of the rehabilitation of an old mountain house. Being in a privileged environment as it is, we thought that the houses had to respect and take maximum care of the environment. That is why, in the rehabilitation of the houses, biocostruction criteria have been followed. Thus the fundamental elements are stone, wood, adobe and mud. On the other hand, the energy used for heating is the geothermal energy that consists of taking advantage of the heat of the earth, not depending in any case or diesel or coal (usual in the area) so it is a totally clean system. The heat is distributed through the houses through underfloor heating. In short, we have made an effort to respect as much as possible the habitat we are in, trying to contaminate as little as possible in the process and during the life that awaits these houses that we hope will be long and that all those that pass through them, enjoy. Geothermal heating by underfloor heating throughout the house In relation to the characteristics, comment: - That the house has three rooms, two with a double bed and another with two beds from which an incredible view of the Curavacas is contemplated. - It also has a double bed in the area for study and library and an extra bed available to anyone who requests it. - There is also a travel cot. - All rooms have a bathroom. On the ground floor - The 50-meter lounge has a flat-screen TV - stereo and DVD. - There are two sofas for three people and in front, the fireplace, to spend unforgettable gatherings in front of the fire. The fully equipped kitchen - With ceramic hob - Oven - Microwave - Washing machine - Dishwasher - Refrigerator - In addition to all kinds of kitchen utensils and small appliances. On this floor there is a small bathroom. There is the possibility of surfing the internet completely free of charge and also, on request, WIFI access. The chimneys have firewood for its use but in case you want additional firewood the kit will cost 4 €. In winter, the use of barbecues is conditioned by weather conditions. Estuvimos en la Parda y la Corva el fin de semana del 18 y 19 de noviembre un grupo numeroso, con el objetivo de subir al Peña Prieta. La casa es ideal para grupos, tiene todas las comodidades y está en un entorno fabuloso, Raúl, el dueño, atiendió todas nuestras peticiones muy amablemente, incluso después de marcharnos nos tuvo que hacer un envío por mensajería con algún objeto que habíamos olvidado en la casa. Totalmente recomendable como punto de partida para conocer la Montaña Palentina y alrededores.